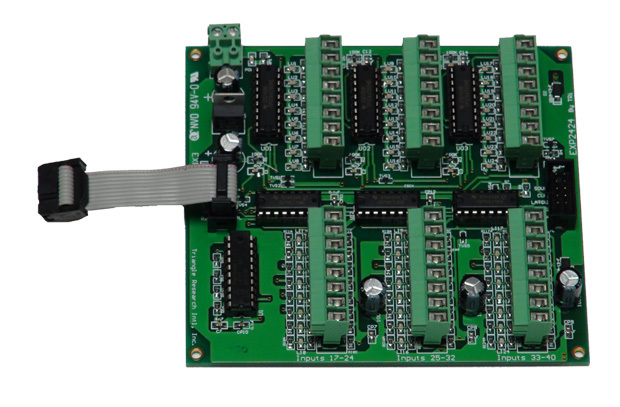 The EXP2424 is an expansion board specifically designed for the FMD and F-series PLCs. It adds additional 24 digital inputs and 24 digital outputs to the FMD88-10, FMD1616-10, F2424 or F1616-BA. The EXP2424 also has an secondary expansion connector on the right side of the PCB which allows additional expansion board to be cascaded (up to a maximum of 128 digital inputs and 128 digital outputs for these PLCs), or a MD-HMI to be connected. The EXP2424 is identical in size to the FMD88-10 PLC. This allows the expansion board to be “stacked” on top or below a FMD88-10 PLC for applications where the controller must be fitted within a very tight space. A FMD88-10 with a EXP2424 stacked together provide 40 digital inputs and 40 digital outputs in a very small footprint. The other expansion board EXP1616R can also be cascaded to the same secondary expansion connector.